.45 Long Colt 180 Grain Hi-Tek Coated Black RNFP Lead Cowboy Action– With our 100% hand-loading techniques- We place the same care and passion into each and every round produced as those do in their own private loading rooms. These techniques produce the most reliable, accurate round of ammunition available on the market today! 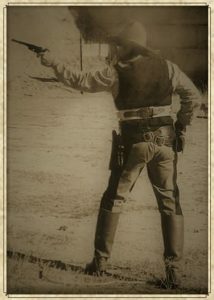 The .45 Long Colt “Cowboy Choice” line is developed for Cowboy Action Shooters by Cowboy Action (SASS) Shooters! Our mild shooting Cowboy Action line meets SASS Power Factors, yet are a pleasure to shoot in repetition with minimal kick back or recoil. The .45 Long Colt gun cartridge dates to 1872 and started out as a round designed for the Colt Single Action Army revolver. In fact, many .45 Long Colt guns today are replicas of the Colt Single Action Army revolver. 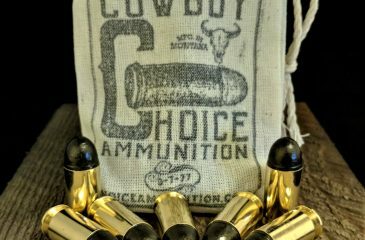 Often marketed as a magnum-handgun hunting round, one of the most common uses of .45 Long Colt ammo today is in Cowboy Action Shooting. Hunters sometimes also use .45 Long Colt revolvers and some derringers (generally for collections or self-defense) that are chambered for the .45 Long Colt cartridge as well. Companies such as Winchester, Rossi, Uberti, and the Henry Repeating Arms company also produce lever-action .45 Long Colt rifles. Hunters and shooters will enjoy the vintage feel of the .45 Long Colt rifle, with its long history of use in the Army and was used for hunting or self-defense in the Old West. With their rich history, .45 Long Colt guns offer both modern functionality and fun for collectors, Cowboy Action shooters, and reenactors. This .45-caliber has long been considered “the gun that won the West.” Noted for its power and reliability, it was the most popular full sized revolver of the late 1800s. Turned out by the Colt Fire Arms Manufacturing Company of Hartford, Connecticut, it sold for $17 by mail order. A classic single action revolver, it remains in production today. The model 1873 revolver, commonly known as the Colt Single Action, Peacemaker, or Frontier, was actually developed in 1872, based on the patents granted to Charles B. Richards and W. Mason. In 1873, the US Army adopted this revolver along with its black powder centerfire cartridge of .45 caliber, and issued it to troops in 2 models. .45 Long Colt Cowboy Action Hi-Tek Coated Lead 200 Grain RNFP– With our 100% hand-loading techniques- We place the same care and passion into each and every round produced as those do in their own private loading rooms. These techniques produce the most reliable, accurate round of ammunition available on the market today! 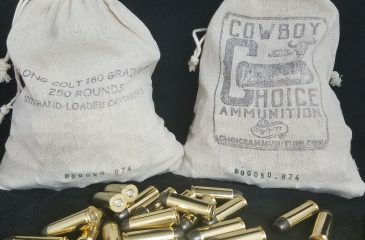 The .45 Long Colt “Cowboy Choice” line is developed for Cowboy Action Shooters by Cowboy Action (SASS) Shooters! Our mild shooting Cowboy Action line meets SASS Power Factors, yet are a pleasure to shoot in repetition with minimal kick back or recoil. We use a unique heat-set “HI-TEK Supercoat” manufactured in Australia, where it has been used for more than 20 years. The Hi-Tek Supercoat Bullet Coating totally encapsulates the lead projectiles and replaces standard wax lube. These 45 Long Colt “Cowboy Choice” Hi-Tek Coated Lead 125 grain TCFP rounds feed reliably in Lever Guns as well. NEW “WELLS FARGO” Ammo Bags!! 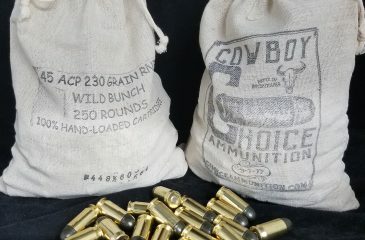 Includes 250 rounds for your SASS matches and make a terrific brass bag for spent cartridges and easy access at your cart! .45 Long Colt Cowboy Action Hi-Tek Coated Lead 250 Grain RNFP– With our 100% hand-loading techniques- We place the same care and passion into each and every round produced as those do in their own private loading rooms. These techniques produce the most reliable, accurate round of ammunition available on the market today! 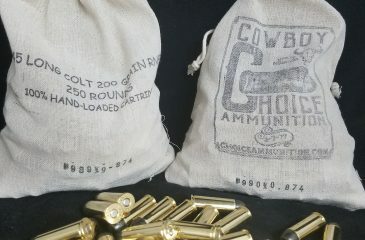 The .45 Long Colt “Cowboy Choice” line is developed for Cowboy Action Shooters by Cowboy Action (SASS) Shooters! Our mild shooting Cowboy Action line meets SASS Power Factors, yet are a pleasure to shoot in repetition with minimal kick back or recoil. .45 Schofield (S&W) 230 Grain RN– The .45 Schofield or .45 Smith & Wesson is a revolver cartridge developed by Smith & Wesson for their S&W Model 3 Schofield top-break revolver. It is similar to the .45 Colt round though shorter and with a slightly larger rim, and will generally work in revolvers chambered for that cartridge. US government arsenals supplied .45 Schofield cartridges for the Schofield revolver and the Colt Army revolver to simplify their armament needs. 45 Colt cartridges cannot be used in .45 Schofield firearms, since the .45 Colt is a longer cartridge. This cartridge was originally designed as a black powder round. It was patented in the USA on 20 June 1871 and 22 April 1873 by Smith & Wesson. It was a Smith & Wesson Model 3 that was modified, due to a suggestion by Major George Schofield, to make it easier for a cavalryman to reload while riding. While the Colt 45 had more power, the speed at which a cavalryman could reload a Schofield was less than 30 seconds, half of the time for a Colt 45. By 1879, the U. S. Army had purchased 8,285 of the revolvers. Due to its reduced power and recoil compared to the Colt .45, it was easier to shoot accurately, yet still retained effective stopping power on the battlefield. It became the standard cartridge of the Army, though the Colt 1873 still was the main issue side arm of the Army. The Schofield was quite a popular handgun in the old west, and may have been used by General Custer at the Battle of the Little Bighorn. The effectiveness of the cartridge in battle, and its reputation for shootability and accuracy, led to the duplication of the cartridges’ characteristics in the .45 ACP. In the early 1880s the Benet (inside) cartridge primer was retired and the modern Boxer type (externally visible) primer was adopted for all future military production of revolver ammunition. Once again, Choice Ammunition has produced a true “Cowboy Action” round in the .45 Schofield, or .45 Smith & Wesson. Our 100% hand-loading techniques produce a mild shooting, low velocity round that is a pleasure to shoot- while being highly accurate and dependable every time you pull the trigger! 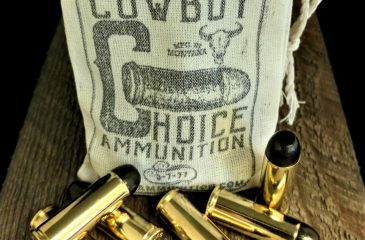 Cowboy Choice Ammunition is an affiliated SASS Merchant, recognized as a leader in true Cowboy Action Ammunition. Our mild shooting Cowboy Action line meets SASS Power Factors, yet are a pleasure to shoot in repetition with minimal kick back or recoil. 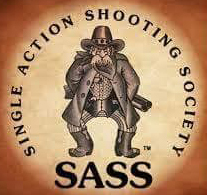 The hottest thing on the SASS circuit!! We use a unique heat-set “HI-TEK Supercoat” manufactured in Australia, where it has been used for more than 20 years. The Hi-Tek Supercoat Bullet Coating totally encapsulates the lead projectiles and replaces standard wax lube. These 45 Long Colt “Cowboy Choice” Hi-Tek Coated Lead 250 grain RNFP rounds feed reliably in Lever Guns as well. 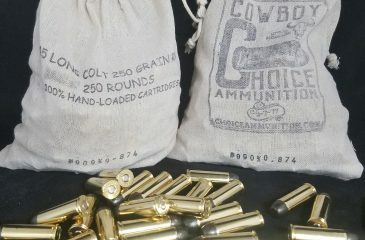 .45 Long Colt 180 Grain RNFP Lead Cowboy Action– With our 100% hand-loading techniques- We place the same care and passion into each and every round produced as those do in their own private loading rooms. These techniques produce the most reliable, accurate round of ammunition available on the market today! 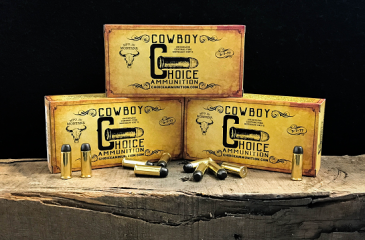 The .45 Long Colt “Cowboy Choice” line is developed for Cowboy Action Shooters by Cowboy Action (SASS) Shooters! Our mild shooting Cowboy Action line meets SASS Power Factors, yet are a pleasure to shoot in repetition with minimal kick back or recoil.